On a beautiful spring day – the first really warm one of the year – we, like everybody else in the country it seemed, felt the itch to rush outside after such a long, damp winter and feel the sunshine on our faces. We decided to go for a picnic but, being us, we chose somewhere with a good bit of history and a liberal sprinkling of spooky stories. So we grabbed the picnic basket and our cameras, jumped in the car and headed off to our neighbouring county of Bedfordshire and the historic Ampthill Park. The area was originally part of the manor of Ampthill held by the d’Albini family in 1086, and a castle was built there in the 15th century, although it was actually more of a palace or fine manor house than a true castle. The castle was home to Henry VIII’s wife Katherine of Aragon for a time, who stayed here whilst her marriage to Henry was being annulled. When Henry returned he decided to build a new lodge, and left the castle to fall into ruins. There’s nothing left of the castle now, but as you walk into the park and look up to the rise of the Greensand ridge you can see two stone crosses. The first is the Duke of Bedford memorial cross, erected in memory of soldiers who lost their lives in World War I, and the second is Katherine’s cross–so-named after Katherine of Aragon–and is all that remains of the castle to mark its place in the landscape. It was only a short – albeit rather uphill – walk from the entrance of the park to the site of the castle, and once at the top you are rewarded with not only a bench to rest on, but also the most spectacular views. When you hear the tagline ‘offers commanding views’ this is what they’re talking about. The landscape seemed to stretch on forever and the view suddenly lent me a sense of the castle which had once stood here. This brought us to our first ghost story of the day, as it is from this cross that a phantom knight on horseback is said to appear, only to gallop off towards the stream and vanish into thin air. The sightings seem to vary in detail, from merely a shadowy figure on horseback to a knight in shining armour complete with a lance and streaming pennant, but—shining armour or no—there seem to have been multiple sightings of the ghostly rider, including several in the 1900’s by soldiers stationed nearby. I dug into this a little bit and discovered that Ampthill Great Park was, indeed, used as training ground for soldiers in WWI by the Bedfordshire Training Depot, including trenches dug to replicate life on the front. That first memorial cross was actually erected on the site of the Training Depot, so anyone stationed there would have been in close proximity to the haunt of the park’s resident ghost! I also discovered that you can still see evidence today of the WWII prisoner of war camp that once stood in the park, whilst Park house was occupied by the army. Ampthill was turning out to be one of those places that look innocently pretty on the surface, but throw layer after layer of history at you at every turn. I do love those sorts of places! 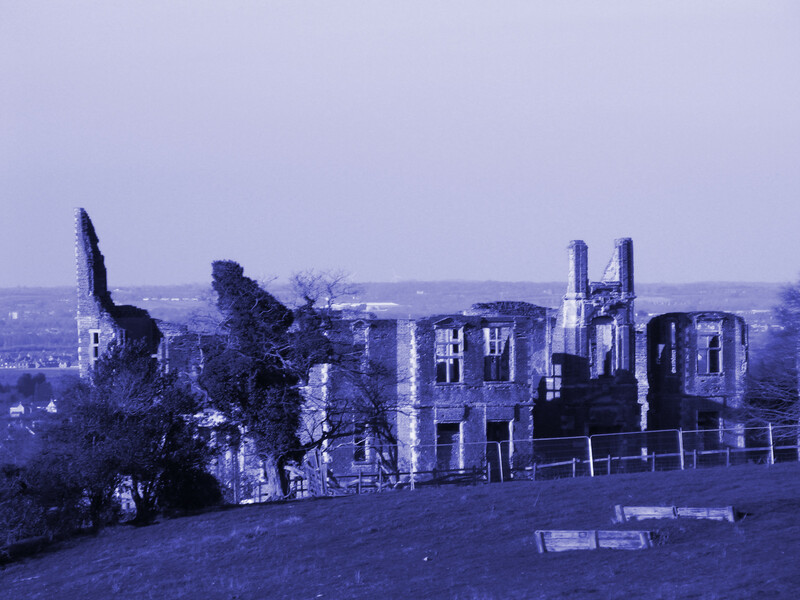 A couple of miles from the park are the crumbling ruins of a once grand 17th-century mansion that was reputedly the inspiration for the ‘House Beautiful’ in John Bunyan’s Pilgrim’s Progress. It has a rather curious history, in that the ruins of the house were deliberately kept to serve purely as a garden feature for the ground of Ampthill Park! It also has its fair share of ghosts, so of course we had to check it out. We hopped back in the car and doubled back on ourselves a little way until we reached a rather sudden exit onto a dirt track which ran a few hundred metres before stopping at a small car park. Our destination was Houghton House, and the rest of the way was strictly on foot. It was an easy walk however, and a very lovely one with the derelict grandeur of Houghton house glimpsed in the distance and the landscape of rolling fields and parkland unfurling below as we ascended the hill. The approach to the house itself dips again down a tree-lined avenue and, emerging once more into the glorious sunshine, I was struck by the juxtaposition of the well-maintained grounds and the decaying ruin of the house. English Heritage are doing a fine job of preserving the site and building, despite its dereliction. My first impression was that of a lawn well-kept, weeds at bay and the avenue approach manicured, which made the grandeur of the derelict Jacobean mansion more haunting somehow. The site was clean and litter free and the only graffiti was that of the historical variety – carved into the stone pillars and dating from the 1800’s which was fascinating in itself. It was originally built as hunting lodge in the early 17th century before being re-purposed as a grand country home for the Bruce family, who were granted the estate by James I. Subsequently bought by the 4th Duke of Bedford who died in a hunting accident in 1767 and then rented, the ill-fated house seems to have been unceremoniously passed from one owner to the next until finally it was deliberately dismantled in the late 18th century. The insides were gutted and the grand staircase torn out and re-installed in the Swan hotel in Bedford, where it remains to this day. Perhaps the unsettled history of the building has contributed in some part to the hauntings that occur there. There are tales of a phantom coach and horses, with witnesses reporting the thunderous sound of horse’s hooves and a jangling of harnesses as the ghostly vehicle races towards Houghton House. One unfortunate woman was so convinced that she was about to be trampled that she threw herself into a nearby ditch to escape the oncoming carriage. She heard the carriage pass by her but looked up to discover that there was no sign of the deadly vehicle. The apparition of a child waving from a doorway has also been seen, but more recent reports have thrown up several accounts of darting shadow figures – something that we were about to experience for ourselves. As fascinating as our trip had been so far, nothing had yet set our spidey-senses tingling. That is until we walked into the ruins of Houghton House. Immediately upon entering the main part of the building the atmosphere changed. It was thick and charged, I could feel that slight electricity in the air that I often describe as cold, wet static – for want of a better description. We both experienced it slightly differently; Fitz with a high-pitched ringing in his ears and the feeling of an electrically charged atmosphere, myself with a feeling of immense pressure around my head, thick, woolly ears and a slight feeling of nausea. Despite the differing physical effects, on comparing notes we discovered we were being affected in the same areas of the house. The central parts were the worst, and in the north and west faces of the house the feeling lifted entirely. We looked around for overhead cables, electrics or anything of that nature but couldn’t find anything obvious. I headed down some steps to the lower level and to my right was what I think would have once been a service staircase. Walking towards it I felt an inexplicable sense of dread, as though I was expecting to encounter something upon peering around the open doorway. This was sudden, unexpected and I felt pretty silly getting all jumpy in the broad daylight of a beautiful spring day. So standing in the doorway I took a moment to pull myself together and try to figure out if anything in the environment would be making me feel this way. Cast upon the brickwork in front of me was a square of sunlight being projected through an empty gap in a window-frame. It suddenly went dark, as though something had moved behind me to block the window and thus the light. I froze while my brain processed this information, listening for Fitz or any other visitors I had missed arriving – and the shadow disappeared. I went off to scout around for the cause but the place was just as deserted as before, with Fitz in a far corner of the field on the other side of the building, and having been there the whole time. When I explained to him what I had seen, he told me he had been experiencing a similar thing, and had seen a shadow peeking in and out of a doorway he had been watching, in a room that I had been nowhere near and in fact, hadn’t even realised was there. During all of this, we were the only people on site. Resident spirits aside, Houghton House is a beautiful place to visit, and one I would highly recommend, although if you do decide to visit, please do so with respect ,and support the great work English Heritage are doing to preserve this wonderful piece of history. It seems the shadow figures are perfectly happy to put in daytime appearances anyway!